While on a bicycle tour of houses in Oak Park, I stopped at a landmark home located at 334 N. Kenilworth that I have always admired. You know, one of those intriguing structures you have driven by for years, and finally the opportunity to dispel the mystery has arrived. The H.P. Young house was built in the 1870s and remodeled by Frank Lloyd Wright in 1895 when he was 27 years old. Wright pushed the house back, adding 16 feet to the front, including a living room, a long veranda and two second-story bedrooms. The symmetrical exterior in the traditional Queen Anne style was contrasted by an interior in modern Prairie Style, an elegant collision. Wright must have struggled with his intense desire to create a unique American style while dealing with the existing traditional home. In the "Cause of Architecture" article published in the May 1928 Architectural Record, Wright expressed his disdain for the style, "Queen Anne! What Murder!" Wright was always at odds with the "painted ladies," and all their fibrous decorations. His exterior, for the most part, avoids decoration in favor of dramatic forms, deep shadow lines and restrained elegance. I was taken by the drama of the intimate entry sequence, the beauty of the interconnected spaces, and the elegance of the details and materials. This was one of those rare occasions when I was shocked into an hour of bliss on a hot, muggy Sunday afternoon. To think we can so casually experience a master architect's work five minutes from our home - ah, Oak Park! This museum-quality structure is a delicious composition of shape, color, contrast, drama, pattern and texture. 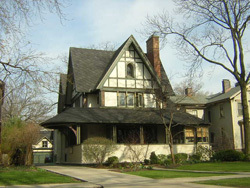 I consider this to be early Prairie, when Wright was influenced by the current popular styles (Shingle, Queen Anne, and English Arts and Crafts). The rich interior is not about conformity. The spaces challenge you to explore them. The quarter-sawn oak trim attracts your hand to caress. The light penetrating the interior through the oh-so-delicate art glass washes the rooms with color. This is a gift of our rich culture that we should not take lightly. After all, everyone in the village knows how important our architecture is to the health and prosperity of the community. The handsome three-story frame structure occupies a beautifully landscaped lot on Kenilworth, one of the premier blocks in the village. The structure has been maintained and kept in immaculate condition. It is one of those properties that has no apparent weakness. The Realtor indicated that the house has been on the market for a "long time," with a bargain asking price of $1,195,000. As I pedaled home I was inspired and saddened by the experience without a clue why this cultural gem could be overlooked. • Garret Eakin is an architect who has lived in Oak Park for 20 years, a preservation commission member and an adjunct professor at the School of the Art Institute.